David Hockney is now the world’s most expensive living artist. 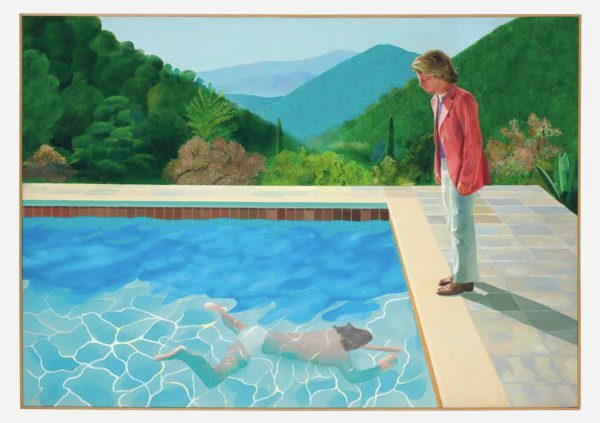 Exclusive PODCAST interview with David Hockney, the world’s most expensive living artist. Multiple records set for black artistst at $362.5 million night at Sotheby’s. Edward Hopper’s “Chop Suey” sells for $91.9 million at Christie’s sale of Ebsworth Estate. Phillips $88.5 million contemporary sale comes up short, with passes on Burri and Pollock. Broadening the sales strategy for Latin American art has been a positive move for some artists’ markets. Stan Lee, Marvel Comics’ real-life superhero, dies at 95. California wildfires threaten architectural landmarks and historic sites. Van Gogh sculpture unveiled outside the London lodgings where he fell in love. In Julian Schnabel’s ‘At Eternity’s Gate’, William Dafoe is Van Gogh, and you should go. Does construction always mean destruction? Exploring UCCA’s new, ecologically responsible outpost project. Art dealer’s family hire detectives to find nazi-looted Degas. When Jackie Kennedy brought the Mona Lisa to America, Paris rioted. MoMA PS1 workers union to hold action in response to museum’s wage policies. Glenn Lowry to remain director of MoMA through 2025. A guide to the Met for the crowd-averse by Jerry Saltz. Lisa Yuskavage doesn’t want to be a “good feminist.” Her paintings are better for it. Berthe Morisot brought a radically feminine perspective to Impressionism. Ai Weiwei says he’s over the whole museum thing and is moving to Connecticut. Ai Weiwei Drops “Life Cycle” t-shirt capsule for solo exhibition. Ai Weiwei speaks honestly on China’s past, present, and future. This series of short video clips features Philippe Vandenberg commenting on his work. PODCAST: Art and conspiracy with Ian Alteveer & Doug Eklund. James Rosenquist’s day job painting billboards led to his greatest work. An artist plans to whitewash the Banksy he bought for £561,000. The Brooklyn Museum has a Frida Kahlo exhibit on the way. The first major UK Keith Haring exhibition is coming to Liverpool. Mass Moca adds another decade to its long-running Sol LeWitt show. Eva Lewitt, the daughter of Sol Lewitt, seems to be having a moment in her own art career. Art Düsseldorf exhibitors react to MCH Group’s decision to sell stake in fair. How Alphonse Mucha’s iconic posters came to define Art Nouveau. The artificial divide between fine art and textiles is a gendered issue. What role does technology play in helping or hindering our wellbeing? Amazon is primed to move into Queens—How worried should the art scene be? Why you should keep a daily sketchbook, and how to get started. How to be an artist, according to Jenny Saville. 10 types of paintbrushes every artist should know. Francis Bacon on how to be an artist. 7 female photographers you should know from Paris Photo. The unsettling rituals of fraternity life, in photos. Vivian Maier’s unseen color photography is being exhibited. The Japanese artist Yasumasa Morimura puts himself in the world’s most famous art works. Yayoi Kusama’s artworks have hit the Vegas strip. 21 of the most beautiful designs in the world, according to Sagmeister and Walsh. Categories: Contemporary Art, Features, Overtime, Street & Urban Art. Tags: Contemporary Art, David Hockney, Features, Overtime, slider-featured.